Discover the Value of Co-op Membership! Please note: You will need to establish a FREE account when you visit the Coop Connections website for the first time to access all of the links below and associated benefits. Blue Ridge Energy is proud to be an integral part of the communities we serve. That's why we participate in the Co-op Connections Program, a program that helps you receive discounts on products and services from participating local and national businesses. Find both in one convenient location through the national Co-op Connections Card website. 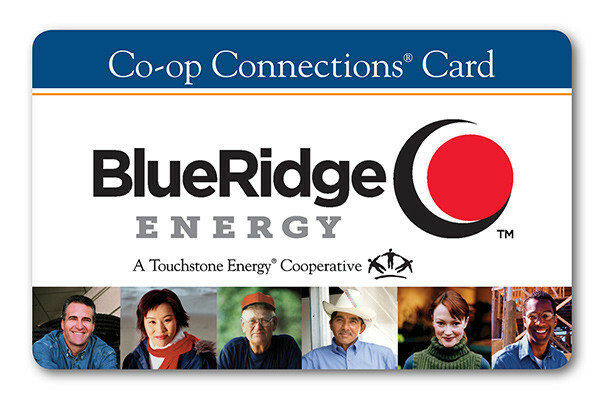 Each member of Blue Ridge Energy receives the Co-op Connections card free of charge. There's no signup. No annual fees. You get your Co-op Connections card simply because you're a member of your local electric co-op. Look for the Co-op Connections stickers in windows at local businesses. Show your Co-op Connections card and get valuable discounts from participating businesses. Watch for updates in our newsletter and on this website. Download the Co-op Connections app! Co-op Connections offers discounts locally, nationally and online for Blue Ridge Energy members from participating Touchstone Energy cooperatives across the country. Use this app to find discounts right at home - or anywhere you travel. The program also includes Healthy Savings discounts from participating providers for prescriptions, dental, vision, hearing, lab work and imaging and chiropractor visits. We encourage you to check out these links for even more saving opportunities: Coupons.com, and My VIP Savings. Best of all, you get all these great benefits for FREE! Your Co-op Connections Card includes 10% – 60% pharmacy discounts that make getting prescriptions simple and more affordable. You will may asked for the member number or group number on the back. Present your card with your prescription at a participating pharmacy to receive a discount. Pharmacy discounts are NOT insurance and are NOT INTENDED as a substitute for insurance. *Note: Walmart will no longer accept pharmacy discount cards, of any type, for opioid prescriptions. However, the card can still be used for all other prescriptions at Walmart.